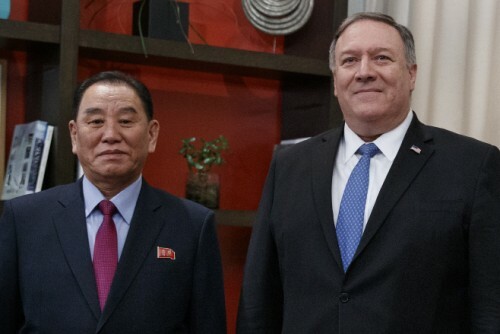 The United States and North Korea are fine-tuning the details of a second summit between the leaders of the two countries in the ongoing working-level talks after practically confirming the venue and time of the summit. While Vietnam appears to be the strongest candidate to host the meeting, both the capital Hanoi and the coastal city of Danang are viewed by analysts as possible locations for the summit. “We’ve agreed to meet sometime probably the end of February,” U.S. President Donald Trump told reporters Saturday regarding the second summit at the White House after his meeting with North Korea’s top negotiator Kim Yong-chol. “We’ve picked a country, but we’ll be announcing it in the future.” His remark indicates that the date and venue of the summit has been virtually concluded. In connection with the venue, a diplomatic source said that Vietnam is practically chosen for the second Trump-Kim summit. If Vietnam is chosen, the capital Hanoi is one of the leading candidate cities to host the meeting. However, Danang is also emerging as a strong candidate considering security issues. The Washington Post (WP) recently reported that Danang will be the venue. Hanoi is the capital of Vietnam and hosts a North Korean embassy. It has been mentioned as the potential venue for the meeting since the beginning since it is located within the limited flying range of Kim Jong-un’s personal jet, Chammae-1. Danang is the commercial center of Central Vietnam with many popular tourist destinations. Both have successfully hosted the Asia-Pacific Economic Cooperation (APEC) Summit and are known to have facilities to accommodate such events. Regarding Kim Jong-un’s possible U.S. visit, both American and North Korean sides have reportedly reaffirmed their positions without any clear achievements. North Korea is calling for sanctions relief and a declaration ending the Korean War, while the United States is maintaining its stance of keeping pressure and sanctions on the North until they see fully and verified denuclearization. As a result, many believe that the working-level negotiations in Sweden would focus on a small package deal involving the North closing down or freezing operations at the Yongbyon nuclear complex and dismantling intercontinental ballistic missiles (ICBMs) in exchange for Washington’s partial sanctions relief. In the process, some observers say that the North may raise the issue of resuming the Kaesong Industrial Complex and Mount Kumgang tourism, which was requested by the North Korean leader in his New Year’s address, on the negotiation table.